Quandary Peak is the highpoint of the Tenmile Range in central Colorado. and the 13th tallest peak in the state. It is a great introductory 14er to climb, both in summer and winter. The standard route up the east ridge is well-marked and easy to follow. It’s an attractive mountain in a beautiful area with great views. It’s very popular year round, so don’t head for Quandary Peak if you’re looking for solitude. My wife offered me a hall pass for a day of mountain climbing in exchange for making a long drive from Boise to visit family near Denver. After considering other more ambitious peaks, I settled on Quandary since I figured being conservative would be best for a solo climb in an area I didn’t know much about. Plus I hadn’t been out climbing much lately and hadn’t been at altitude for a long time. But staying with family the night before who live at over 8000’ feel elevation would be good to help with acclimation. I was up by 5am and made it to the Quandary Peak trailhead by 7am. There were already three other cars there. I’d read some recent condition reports about the snow being very supportive, and elected to leave my snowshoes in the car. Starting out, the trail through the snow in the trees was like a superhighway and was very easy to follow. Once the trees start thinning, the track starts spreading out, but navigation is still easy. Just climb up! The forecast was for clear skies, which was right on. Just a little breeze to deal with, and I made it to the 12k level in under an hour, with the sun beginning to rise above Hoosier Ridge at my back. From this point on, the views were very open and the route ahead was very visible. That made it feel like I wasn’t making very fast progress, but it turns out I was on a good steady pace. The views were getting pretty good too. I could also see 3 or 4 climbers on the ridge in the distance ahead of me. Seeing them ahead motivated me to move faster, but I didn’t catch them until they were on the way down. The open slopes from 12k to 13k was a grind, and the last thousand feet to the summit was actually the most enjoyable to me because of the views. Plus I was feeling strong thanks to the prior day of acclimation. Just before reaching the summit, I passed the four climbers ahead of me as they started their descent. I’d made it to the top in about two and a half hours. Not bad for a low-lander. There was nobody behind me, so I got to enjoy the summit all for myself for about 20 minutes. I layered up to keep warm in the wind, and enjoyed the sunshine and views while taking a few photos. Once I started back down, it wasn’t long before I started passing folks on their way up. In total, I passed well over 30 people during my descent. Mainly climbers at first, and then mostly skiers further down. Having left the snowshoes in the car, I was a little worried about the snow getting soft as the sun came up, but the footing was actually pretty ideal. A lot of folks in CO seem to use micro-spikes. I don’t have any of those, but I did bring along some lightweight crampons just in case. It turned out I didn’t need them going up or down since the snow had softened just enough for traction, but not too much to cause post-holing. I made it back to the trailhead by just after 11am, having done the climb in about 4 hours round trip. All and all it had been a very nice climb. Perfect conditions, beautiful scenery, and my first Colorado 14er. Plus I made it back to the family by just after lunch to preserve some future climbing credits. 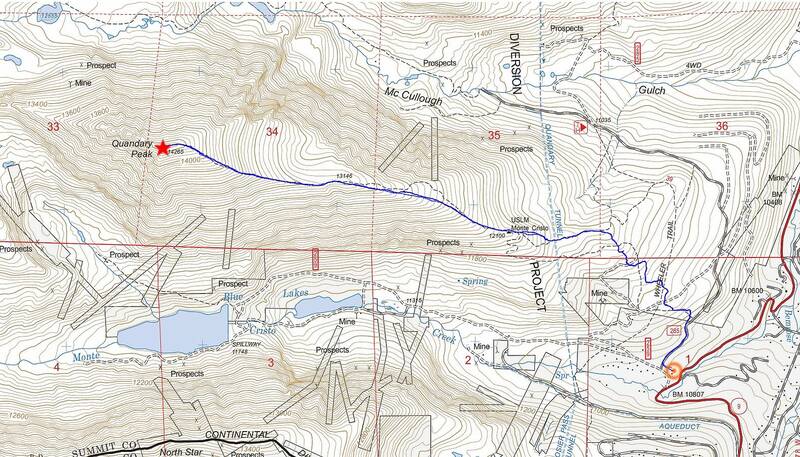 Map of the route, just over 6.5 miles and 3500' elevation gain, round trip. Early view of the easy to follow trail. Beginnings of a great sunrise over Hoosier Ridge to the east. One of the first open views of the summit. A few climbers ahead of me. Good view of the upper east ridge of Quandary Peak. Nearing the summit of Quandary Peak. Splattski shot of me on the summit. Summit view to the east-northeast. Summit view to the west-southwest. Another view from the summit looking northeast. Looking back on the conga-line of climbers heading up. Trail back down through the trees. Three toed woodpecker doing his work on a dead pine tree. View of the east ridge of Quandary Peak from Highway 9. IdahoAlpineZone is unofficially sponsored by Skippy Peanut Butter.